LISOT News: February Sarasota Clinic - Sun and Fun for All! February Sarasota Clinic - Sun and Fun for All! 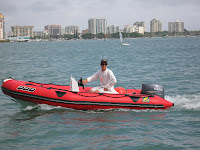 Last week we had a great clinic at the Sarasota Sailing Center (site of the 2006 USODA Nationals). Trevor and Ale ran a terrific 4 days of sailing with good wind every day, warm sun and a terrific group of sailors from all corners of the US. The group sailed both out in The Gulf (in search of swells) and in the Bay with its challenging current (and playful dolphins). 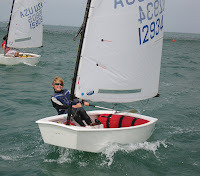 Sailing including lots of drills, daily fleet races as well as some team racing. It was fun to have kids from LISOT and TeamFor, having just competed hard against each other in the USODA Team Race Mid-Winters, team racing together on the same teams. But it wasn't just the kids doing all the sailing. During a rudderless race, Ale commandeered an Opti and was seen working his way upwind! Trevor shot a lot of video from the water, which the kids reviewed each afternoon. Contrary to rumors that LISOT chartered a helicopter for overhead video of starts, it was really Tom Widmeier and David Shaner manning the HeliCAM by hiking all the way up the John Ringling Causeway to get some great shooting angles and video. On Saturday the Bay was a buzz with a whole host of other classes, including a 29er clinic with some LISOT opti graduates (Warren Anderson, Dave Dellenbaugh), a laser regatta, the local Sarasota Opti fleet, and a board sailing regatta. With most people staying at the Homewood Suites (a great hotel that Tory Crane found and negotiated a good group rate), the breakfast and dinner was often as a group at the hotel. And one evening a group of the girls got together for a Movie night. The last evening we had a poolside BBQ around at the hotel. Janet Grapengeter and Tammy Cash made a road trip to Sam's Club and bought a truckload of burgers and hot dogs. Tom Widmeier was Grillmaster Extraordinaire, and Lisa Purton baked fresh brownies and cupcakes for desert. Thanks to Susie Martin and Lisa Purton for coordinating with the Sarasota Youth Sailing Program. We couldn't have had this clinic without the support of SYS President Ken D'Agostine; Executive Director Stuart Gilfillen and Secretary Patti Tebo for graciously welcoming us to their venue. The award for furthest traveled goes to Kate and David Shaner for coming all the way from Seattle! Frank Cash and Madison Gates get the "roll out of bed" award for traveling the least distance. And MaryEllen Wefer (with help from Susie and Janet) get the award for making the most lunch sandwiches every day.